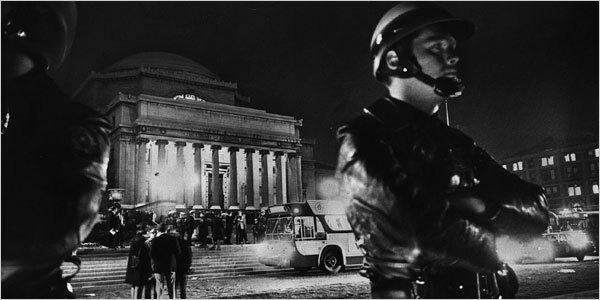 For the fortieth anniversary of the Columbia Crisis of 1968, the Columbia University Archives created an exhibit within the galleries of their repository. Students, professors, staff, scholars, community members, and protest participants alike visited the University Archives to observe the exhibit. Its engaging narrative and presentation of powerful images and written documents proved a worthy tribute to the events of that Spring, and the Archives staff now seeks to build a similar exhibit online. The primary purpose for the creation of a digital exhibit is for it to have the ability to reach a wider audience, as well as to allow for some of the most valuable items within the Archives’ Student Activism and Protest Collection to be preserved in an alternate and more permanent manner. As a result, this project will receive a significant amount of financial and institutional support from Columbia University. The University will provide sufficient office space within Butler Library, ideally within or in close proximity to the 6th floor location of the University Archives. It will additionally offer the advisement of the University’s IT Tech Department with regards to the establishment of an efficient database and the design of the online exhibit. The University has also agreed to provide stipends for two student employees, who will assist the Project Director for the duration of the project (approximately one year). If necessary, Columbia University will contribute to the payment of externally contracted tasks – such as the scanning of oversized items or the assistance of a web designer. The project staff also hopes to gain support from the National Endowment of the Humanities, particularly under its Digital Humanities program grant. In addition to the financial backing of the host institution, the project staff has made contact with multiple participants of the events of Spring 1968. Through discussions with these individuals, the staff has been made aware of the deep impact these protests placed on their worldview and personal value. Their participation in these activities, in many cases, led them toward future dedication to human rights and progressive movements. It is apparent that they all understand the need to bring these protests to the foreground, to shine a light upon them so that their perspectives may be recognized in a candid, truthful manner. Project staff will honor the constructive comments and suggestions of this Advisory Board, taking their opinions into serious consideration, with the goal of creating an exhibit that accurately represents them. The staff will hold regular meetings to consult with the event’s participants, to review each stage in the project’s progress, while welcoming any input they may offer. Preliminary contact has already been established with prominent actors, such as: Mark Rudd (Chairman of Columbia SDS and media-proclaimed ‘leader’ of the Columbia Crisis), Cicero Wilson (head of the Student Afro-American Society), and John Shils (head of the Columbia Citizenship Council). A full-time Project Director, who will be a temporary hire of Columbia University for the duration of the project, will head the staff. She will be assisted by two student employees who are currently studying within Columbia’s History Department. The Project Director prefers the involvement of those who are currently studying at the graduate level, though undergraduates will also be considered. A background in archival, museum-related, or digital work will be most valued. The project will run for the duration of approximately one year. The prospected time will provide for the digitization of selected items and the creation of a corresponding online exhibit. Documents, photographs, and other pieces of memorabilia from within the Archives’ Student Activism and Protest Collection will be chosen, initially, based on their relation to the events of April 1968. Any items focused on earlier or later protests will be immediately excluded from consideration. Particular emphasis will be placed on the viewpoints, planning procedures, publicizing efforts, and manifestos of the participant student organizations – primarily SDS (Students for a Democratic Society), SAS (Student Afro-American Society), and CCC (Columbia Citizenship Council). The written correspondence and reflections of individual students will also be given high consideration. Photographs will be required to have been taken within the scope of April 23-30, 1968, with greater interest given to those that effectively capture the high tension and focused passion of these events. There will be a highly concentrated effort to equally include the papers and images of the varied student organizations, in order to recognize that these events were (to a degree) racially integrated. Above all, the project and the selected images it will display online, will seek to represent the voices of all participants, with as little bias as possible. All digitized objects within the project will be managed through the use of the Microsoft Access database program. Items will be named, described, and sorted based upon the standards of the Library of Congress. These standards will be made clear, from the outset, to the two student employees. They will be primarily responsible for the initial tagging of all items. The selected documents and photographs will be digitized by using a standard flat-bed scanner. Scanning will operate under high resolution, with the images imported into the Adobe Photoshop program for editing and enhancement. All scanned items will be saved in two formats – both in archival quality (TIFF) and in a lower, more easily accessible quality (JPEG). These files will be saved in the external hard drive that will be shared among all computers involved with this project. Most of the selected items will fit within the standard scanner’s accepted size of 8 ½ x 11 inches, but if we choose to digitize oversized items such as flyers or posters, this work will need to be contracted out. 1. The staff will determine the specific items that are to be digitized, based upon the specific scope of this project. 2. The name and description of each item will be entered into the Microsoft Access database created solely for the project. 3. The staff will digitize photographs first. The selected photographs will be ordered chronologically, with regards to the time and day of the subject captured. With this particular subject, the order of events is crucial, and to have a chronological account of photographs will be a significant help when establishing the grand narrative. 4. The staff will then digitize all written documents, which will be ordered on the basis of author/related student organization. This follows the same organizational style chosen by the Columbia Archives for the actual collection. 5. The third group to be digitized will include all memorabilia, such as flyers, posters, buttons, or pamphlets. These will be organized with regards to the affiliated student organizations. Many objects, though, are of a more general nature, with no specific affiliation. Those will be digitized following the more specifically attributed items. 6. After the scanning, student employees will create metadata for each item and enter that information into the Access database. 7. If time allows, written documents will be transcribed into a word processing program, such as Microsoft Word. 8. Project Director will review the work of student employees to provide for overall accuracy. 9. The Project Director will design the corresponding website with the assistance of both student employees and the Columbia IT Tech staff. 10. Selected digitized items will be uploaded to the site and the online exhibit will be built, in a narrative format, facilitating these items. 11. The project’s website will be maintained over time by the Project Director and various staff within the University Archives. The project’s website will revolve around the online exhibit of the Columbia Crisis of 1968. The exhibit will run in a narrative format, with each noteworthy event presented chronologically. Events will be illustrated through corresponding photographs, documents, and other memorabilia. These items will be presented alongside the general narrative, with the option to click and view the item more carefully in a new window. Particular attention will be paid to representing all primary student groups equally within this narrative. The consulted members of the Advisory Board will help to assure that this goal is reached. The necessary hardware will include: a standard flat-bed scanner, and three computers (with ample space on the shared hard drive for the scope of this project). Software will require: Microsoft Access, Adobe Photoshop, and Omeka (to create and publish the online exhibit). You're done a great job on this management proposal- very thorough! You may want to beef up your staffing section, however. It seems like the project director is responsible for too much: designing the website, writing the narrative, quality control, and maintaining the longevity of the site. I wonder if it would be more realistic to find a web designer to create the site, someone else who is knowledgeable on the topic to do the writing, and have the project director perform more managerial duties.